How and Where to Buy Mevacor Online? You can buy Mevacor and other cholesterol medications online through our Canadian International Pharmacy at huge savings. We offer RX and OTC medications online with a valid prescription from your doctor. At Canadian Pharmacy World, your health is our priority. You can place the order online, by mail, by fax or toll-free over the telephone at 1866-485-7979. Are There Alternative Names for the Brand and Generic Mevacor? The generic form of Mevacor is Lovastatin. 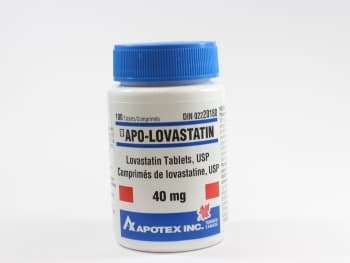 It comes from Canada also called Apo-Lovastatin manufactured by Apotex and PMS Lovastatin by Pharmascience. We also carry the generic Lovastatin from India also called Lovacard manufactured by Cipla. What Dosages and Forms is Mevacor available in? Mevacor is available as tablets in the dosage forms of 20 mg and 40 mg.
What Are The Possible Side Effects of Mevacor? Some of the common side effects of Mevacor include fever, blurred vision, muscle effects, constipation, diarrhea, gas, stomach upset, nausea, pain in the abdomen, headache, dizziness, skin rash, poor memory, memory loss, confusion, depression, erectile dysfunction. Some of the serious side effects of this medication include increased blood sugar, allergic reactions, liver problems, generalized weakness, unexplained muscle pain, muscle weakness or tenderness. These are not all the possible side effects of Mevacor. In case of any unexpected effect, consult your healthcare professional immediately. Are there any Precautions and Drug interactions for Mevacor? Avoid drinking large quantities of alcohol. Do not start taking other medicines unless you have discussed it with your doctor. •	Are of childbearing age. Cholesterol compounds are essential elements for the development of a fetus. Cholesterol-lowering drugs such as lovastatin can cause harm to the fetus. Mevacor should be stored at controlled room temperature between 15°C and 30°C, protected from light. Keep out of the reach and sight of children.